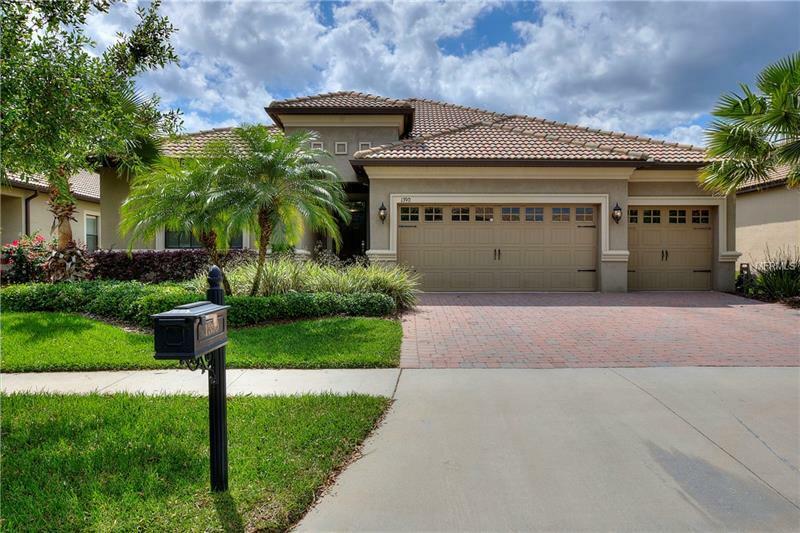 Stunning home in the exclusive gated community of ChampionsGate. Absolutely Flawless! Full Golf Membership included in HOA! Beautiful 3 bedroom 3 bath home used as a second home by it's current owners. Kitchen complete with stainless steel appliances granite countertops and breakfast bar. Master features separate shower and garden tub with granite vanity two sinks and two walk in closets. Comes with many upgrades to include an extended Lanai. Home is located across the street of the Par 5 18th hole. This luxury gated resort style community is centered around the Oasis Club a 14000 Sq Ft Clubhouse that includes a restaurant movie theatre fitness center game room tiki bar lazy river cabanas and much more! Coming soon is the "Plaza" a residence only clubhouse that is near completion. HOA covers access to Oasis Club and it's amenities full golf membership tennis gated entries complete lawn care security monitoring TV phone and internet. CDD is included in taxes. ChampionsGate Community is the perfect place to live to enjoy all the theme parks shopping and dining experiences that the Orlando area has to offer! This community is close to all major roadways to include I4 192 and Toll Road 429.